What is it? Cowbird allows people to tell multimedia stories, incorporating text, photos, sound, subtitles, roles, relationships, maps, tags, timelines, dedications, and characters. It currently by invite only. How is it of use to journalists? 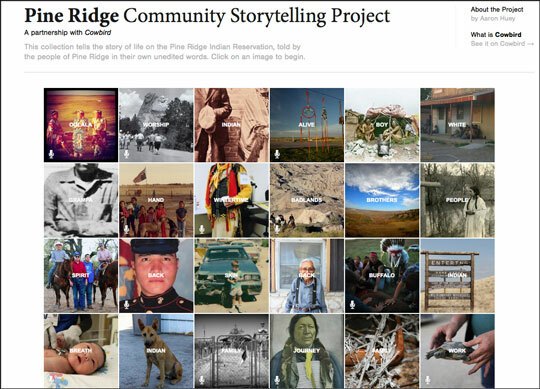 Cowbird has been used by the National Geographic to allow people living in the Pine Ridge Indian Reservation to tell their own stories, in their own words and pictures. The title has gathered the unedited stories on its site by teaming up with the creators of the storytelling tool. Mediashift has an article on ‘how National Geographic used Cowbird storytelling tool to tell a reservation’s whole story‘, which explains why the title opted for this approach and how they teamed up with those behind the platform. It’s well worth reading. Other news outlets could clearly take inspiration from the National Geographic and launch their own storytelling projects. It is also worth looking at the roles (such as journalist) and thinking about how people and their stories can become sources for a feature or news item. This entry was posted in Handy tools and technology, Tool of the Week and tagged Cowbird, journalism tool, storytelling on August 14, 2012 by Sarah Marshall. One of the sessions at today’s Guardian Activate Summit looked at how data and social media are influencing storytelling. Here are four innovations, shared by Phil Fearnley, general manager, Future Media News & Knowledge, BBC; Stew Langille, CEO of Visually; Neal Mann, social media editor at the Wall Street Journal; and Simon Rogers, editor of the Guardian’s Datablog and Datastore. The BBC site for the London Olympics gives every athlete, venue and sport its own page and apart from the homepage all are updated automatically with with the latest video and story content on that particular topic. The Olympics site also focuses on personalisation, giving the audience the ability to favourite an athlete or sport and follow. Fearnley said the development of the site started two years ago. We had to satisfy the ‘main eventers’ and the ‘sports fanatics’. And we wanted to give the idea that you were never missing a moment. The other innovation shared by Phil Fearnley was the BBC’s “live event video player”. Viewers can use the interactive video player to jump back to a particular point in an event, such as a triple jump win, and then switch back to a live report. With “up to 24 live events at once”, the player gives an experience that, according to Fearnley audiences say “is better than TV”. We are transforming the way we tell video stories to our audiences. 2. Visually is allowing journalists to create their own data visualisations. Visually launched last year “to democratise the way people use and consume data”. Today, the site has more than 11,000 infographics, 4,000 designers, and around 2 million visitors per month. In March, it launched Visually Create, a collection of self-service tools that allow anyone to create beautiful infographics. Stew Langille, CEO of Visually told the conference that the team is now developing further tools which will allow journalists or anyone interested in creating a visualisation to do so. Neal Mann, social media editor at the Wall Street Journal (@fieldproducer on Twitter) talked of the potential of “multilayered storytelling”. 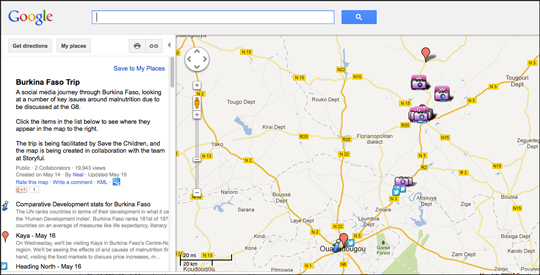 Before taking up his new role at the WSJ, Mann went to Burkina Faso. He worked with Storyful, which built a map which added his social media updates, photos (Mann is also a photographer) which was auto updated and which he shared with his large social media following. “It allowed people to engage,” Mann said, explaining that updates from a less reported area were “continuously dropping onto people’s phones”. The map got five times as many hits as a Guardian’s long-form piece of journalism from Mozambique, he said. Other ways journalists are sharing “background” to text stories are by taking 360 degree images from a location. His thought is that if you marry the two storytelling techniques, a social media map and long-form journalism, it would be even more powerful. If you can combine the two it’s a great way news organisations can get people to engage in long-form journalism. The next level for me is that multilayered storytelling. Simon Rogers, editor of the Guardian Datastore and Datablog, shared examples of the Guardian’s data journalism. This entry was posted in Data, Events, Online Journalism and tagged #Activateldn, Neal Mann, olympics journalism, phil fearnley, Simon Rogers, storytelling, visually on June 27, 2012 by Sarah Marshall. The Living Stories project is an experiment in presenting news, one designed specifically for the online environment (…) Complete coverage of an on-going story is gathered together and prioritised on one URL. Having made the format open source in February, Google has now created a plugin for blogging platform WordPress to help publishers create their own “living stories” more easily. This entry was posted in Editors' pick, Online Journalism and tagged Digital storytelling, google, Living Stories, storytelling on May 4, 2010 by Laura Oliver. 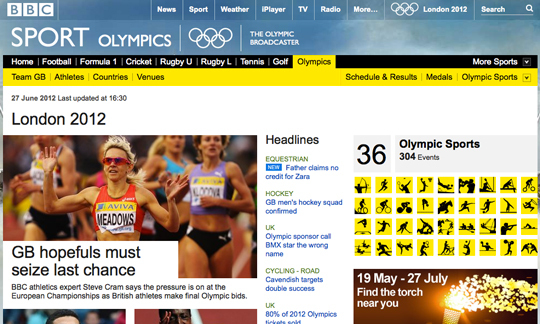 BBC Research and Development blog: Could the Mythology Engine be applied to online news stories? Interesting prototype from the BBC for a new way to explore the stories, characters and archives of drama series. “The featured characters stories and things all link to other places in the Mythology Engine,” says the video. While the idea is currently being applied to fictional series and dramas, such as Doctor Who, the alternative way of navigating through an ongoing story, of learning more about the key characters and events and being able to discover the connections between these is an interesting prospect for news storytelling. And should this model and framework make us think differently about how we write and produce stories? Could we start to create narratives that are tailored for the web? We’re already seeing experiments by news organisations with presenting ongoing stories with deep archives, such as the New York Times work with Google on the Living Stories project, and ongoing topics featuring characters with multiple connections and important backgrounds, like Channel 4’s Who Knows Who politics site. The Mythology Engine goes a step further in the way it uses data to link elements of the story together and present them in an exciting and explorable format for users – could a version of this be created for more rapidly updating, unpredictable news events? This entry was posted in Editors' pick, Online Journalism and tagged BBC, navigation, storytelling, the mythology engine on March 31, 2010 by Laura Oliver. This is the third in a series of six blog posts by Adam Westbrook, each with six tips for the next generation of freelance multimedia journalists, republished here with permission. Follow the series at this link or visit Adam’s blog. A lot of the focus for multimedia journalists and digital journalists has been on new technology: using Twitter, learning Flash. But there’s a danger that in the rush to learn new skills, we forgot (or never learn) the oldest ones. And there is no skill older, or more important, than storytelling. Maybe you think it’s something you can’t learn; it comes naturally. You might think it’s something with no rules: each story is different. True, but there is a science to storytelling as well as an art: here are six secrets. Every story needs a character. Lord of the Rings has dozens, but your short doc or audio slideshow might only have one. Either way, they need to be compelling and they need to be embarking on a journey. And we need to like them or be fascinated by them, because we’re going to follow their journey: and we want our audience to follow it too. No matter what your story, it needs a character. In old-media land this is known crudely as the ‘case study’. (Think how many TV news reports start with a case study!). But they are crucial because they humanise what might actually be a general issue. Making a doc about homelessness? You best make sure it stars a homeless person. Beware though the difference between ‘character’ and ‘characterization’. Robert McKee in his excellent book Story tells us the latter is the outward description of a person – their personality, age, height, what clothes they wear – but character is the true essence of the person in the story. That true character is only revealed when their journey puts them under increased pressures. The decisions we all make under pressure are the ones which reveal our true character. The next thing you want to do is find your story’s narrative arc. Remember I mentioned your character’s journey? Well, that’s your narrative arc. It starts with what Hollywood screenwriters call ‘The Incident Incident’. It’s the moment which instills in your character a desire to achieve a seemingly insurmountable goal/object of desire. It sets them on a mission – a quest. Stories work better with a real play-off of positive and negative charges. Something good happens, and then something bad. Then something even better than before, and then something even worse than before. Robert McKee describes a second device, called ‘gap of expectation’: that’s where your character’s expectations of an event are blown apart by reality. 3) Oi! Where’s the conflict? You’re making a film about that homeless person on a mission to get his life back on track. The first thing he wants to do is get some money for a small flat. He asks the council. They give him the money. The end. Traditionally stories end in a climax. The ever increasing ups and downs culminate in either an ultimate high (happy ending) or ultimate low (sad ending). Either way, the key word is ‘ultimate’. In Hollywood-land the ending must be so climatic they cannot possibly imagine another way of doing it. In the real world it is not always the way, but you should have half a mind on how your story is going to end. Crucially if they’ve been set off on a quest, they should finish it for better or worse. The ending should still be ‘absolute and irreversible’. There are lots of little storytelling devices you can use to add some sparkle to your work. Book-ending: returning the character/place/event which opened your piece, at the end, is a nice way to sum up what’s changed. It can add a bit of emotional punch too. Get the crayons out: popular in internet memes everywhere, getting people to write something down and hold it up to the camera is very effective (just check out SOTM if you need proof); I know of a very experienced reporter who took crayons and paper to a refugee camp and got children to draw the terrible things they’d seen: another great device. These guidelines are really used by authors, and screen writers – people who create stories from scratch. As journalists we aren’t making up stories (hopefully not, anyway) – but we should have our eyes and ears open to these elements in the real world to heighten the sense of story for our audience. The best way to learn the craft of storytelling, is to get out there and tell some. This entry was posted in Editors' pick, Freelance, Multimedia and tagged 6x6, Adam Westbrook, Freelance, storytelling on August 21, 2009 by Laura Oliver.